Minnesota Steelheader is a non-profit organization run by an all volunteer board of directors. We all share a common interest in improving the Lake Superior steelhead fishery of Minnesota's north shore streams and rivers while striving to inform, inspire, and educate anglers and individuals on the water, on-line and in the community. Since the inception of this website in 2005, we have gravitated to the wonders of technology and social media to help us achieve a great deal of our mission, but it doesn't stop there. Here are some highlights of what have done and are currently doing - off-line. 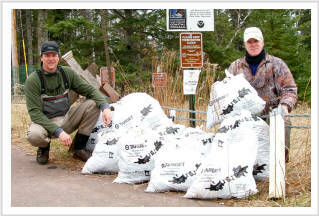 • Adopt-A-River program: In 2011 we joined the MN DNRs program and adopted the Sucker River along Minnesota's North Shore. We funded the manufacturing and installation of our own location signage and in that first year we collected over 170 pounds of trash. Thanks to all the volunteers who stepped up! • Receptacle Roundup campaign: A survey we conducted found that the open barrel trash cans along the lower north shore scenic highway rest stops and rivers were a big part of a litter problem along portions of the lower N. shore - how ironic. Our view was "you brought, you take it." Today the trash cans are gone and the litter has declined dramatically. • Streamside clinic: An information packed clinic conducted by our volunteer staff along a river during the fall pink salmon run. The clinic teaches the basics of fly and drift fishing for steelhead and salmon as well as habitat, fish migration, and how to "read water". The fall season lends favorable as the salmon are predicable and the rivers are low and easy to illustrate fish habitat and migration. 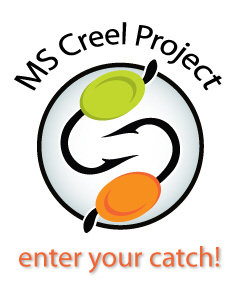 • MS Creel Project: We are not scientist, but we have some very knowledgeable anglers and data junkies on our staff. We have been collecting migration data (temps, flow, returns, etc.) for years. In 2013 we launched this project as a way to further understand steelhead migration along our north shore rivers. We had incredible input from so many anglers. • Meet-n-Greets: Non-formal off the water gatherings around the steelhead season. A great outlet for the public to share tips, stories, techniques, and pick the brains of our staff. A priceless event for all anglers. • Report Card project: We designed and produced a unique card that we pass out to anglers. There is space to record your catch that can later be used to take part in our Creel Project. We also are utilizing the power of a QR code. Anglers are able to scan the code streamside, taking them directly to our creel project sign up page. • Habitat: We (MS volunteers too) will be working closely with the MN DNR and other organizations on continued habitat and fisheries projects. visit our homepage for details. 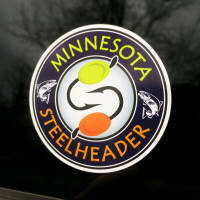 Minnesota Steelheader relies on the financial contributions of ordinary anglers like you, conservation minded individuals, and businesses to help fulfill our mission. Nobody here gets paid, all financial support goes right back into keeping MS growing, informing and educating. Maybe it is just the programs we provide that interest you, or maybe the fishing reports, or the in-depth migration data charts & graphs, or maybe you simply support the same values of keeping the steelhead fishery healthy and prosperous. Whatever you interests, we are glad you are here. We have several exciting projects on the table this year. 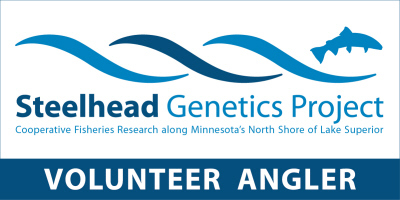 We will be heavily involved with a cooperative Steelhead Genetics research Project, provide more hands-on volunteer opportunities, assist with restoration and habitat programs, we are looking at more clinics and seminars, and more tools and information to help anglers improve their angling experiences. We hope to make some great things happen this year, but we need your support and that of other like-minded anglers, individuals and businesses. Please consider a donation today. Tight lines to you this season! The HWY 61 window decals are 3.5" x 3.5" with an easy to apply adhesive back. All profits from our window decal sales go right back into supporting our North Shore Steelhead fishery. Display an original steelhead window decal. Our logo window decals are 2.75: dia. with an easy to apply adhesive back. All profits from our window decal sales go right back into supporting MS and our mission. Please note that though we are a registered MN Non-Profit, we do not hold charitable 501c status. 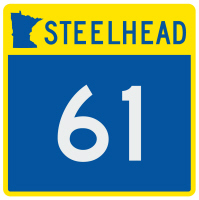 Contrubutions to Minnesota Steelheader may not be taxdeductable.